Several years ago, my husband and I owned a sailboat. We don’t live near the ocean, but we hauled our boat to a nearby reservoir nearly every weekend during the summer. We’d rig up the sails and motor out from the dock and spend most of the day drifting along, just waiting for a breeze—and dreaming of living near the ocean, where the wind would be strong enough to fill our sails and drive the heat away. 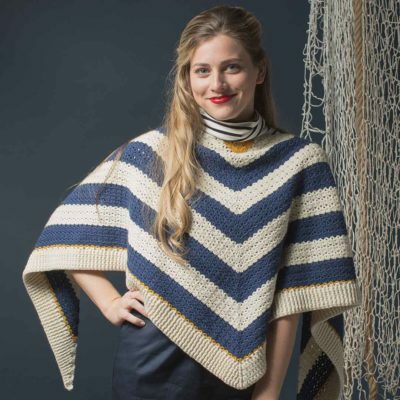 These days, when I conjure up an image of that seaside life we dreamed of, I picture myself wearing the Going Ashore Shawl from Interweave Crochet Summer 2018: the perfect wrap for keeping the sea breeze at bay! 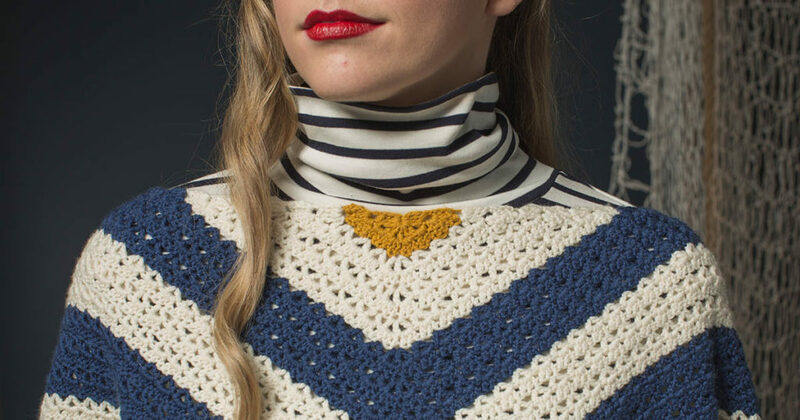 Worked from the center out toward the ribbed border, this delightful shawl has vintage appeal but stays modern with pops of yellow in the center and around the border. Wear it on your next trip to the shore for a look with classic nautical style! FINISHED SIZE About 73″ wide and 23″ tall, blocked. YARN Sugar Bush Yarns Itty-Bitty (65% fine superwash merino, 25% nylon, 10% cashmere; 153 yd [140 m]/1¾ oz [50 g]): #5001 buttercream (A), 6 balls; #5008 indigo (B) 4 balls; #5009 sunglow (C), 1 ball. NOTIONS Yarn needle, removable stitch marker (m), 1. GAUGE Rows 1–8 of Shawl = 10¾” wide and 4″ tall, blocked. Gauge is not critical for this project. Keep sea breezes at bay with the Going Ashore Shawl!